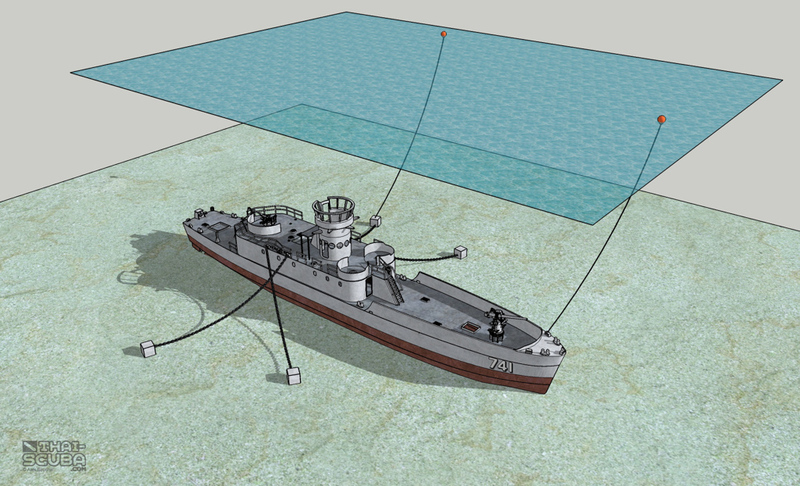 The HTMS Prab wreck lies at a convenient depth of 22m. 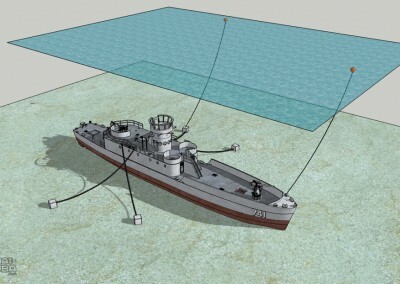 Two mooring/ ascent lines are attached, one to the bow of the wreck, another to the weight holding the rear left stabilizing chain in place. 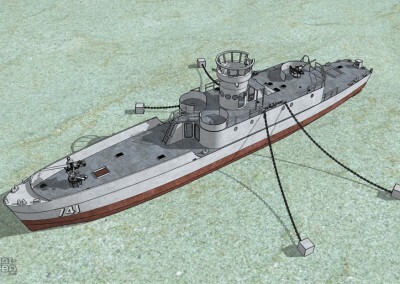 View of the full wreck. 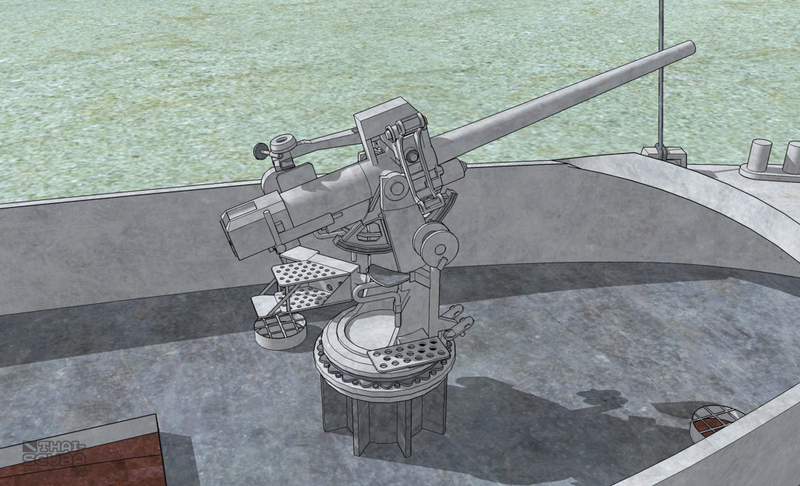 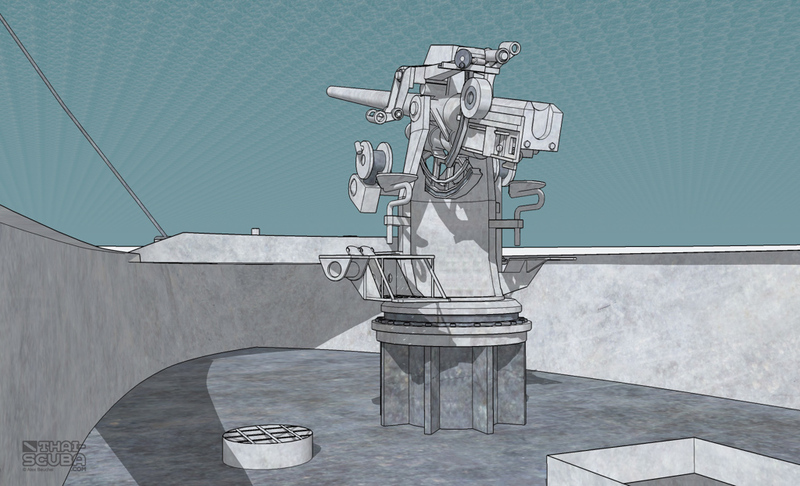 The 3”/50 caliber gun on a pedestal for added height. 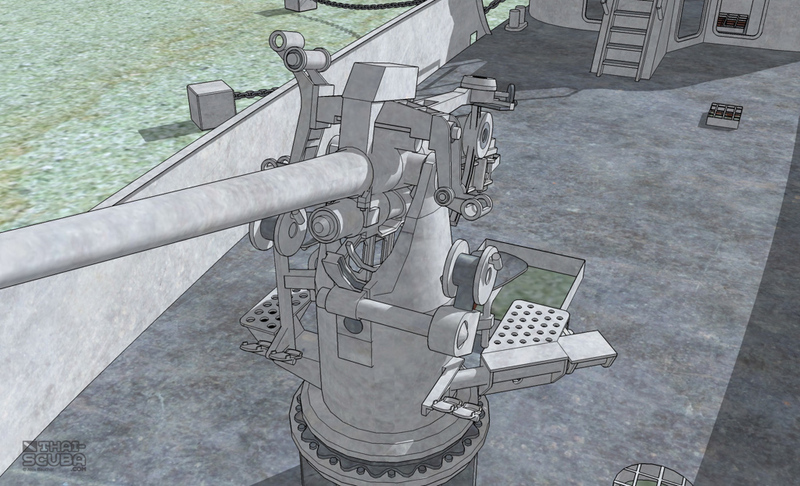 The same type of gun crowns the HTMS Sattakut (Ko Tao), however, flush to the deck plates of a forecastle deck. 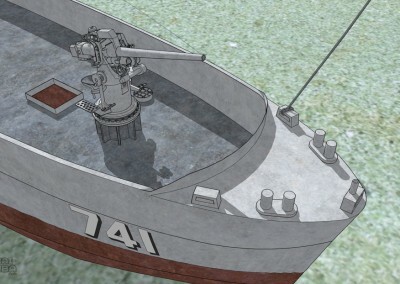 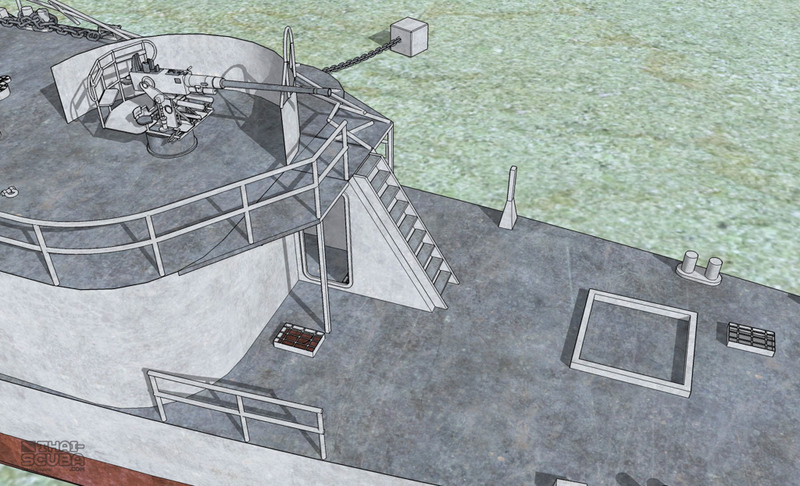 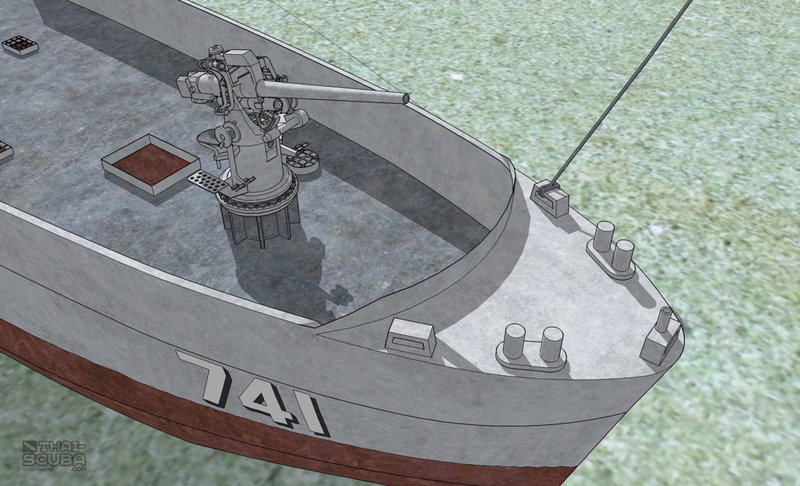 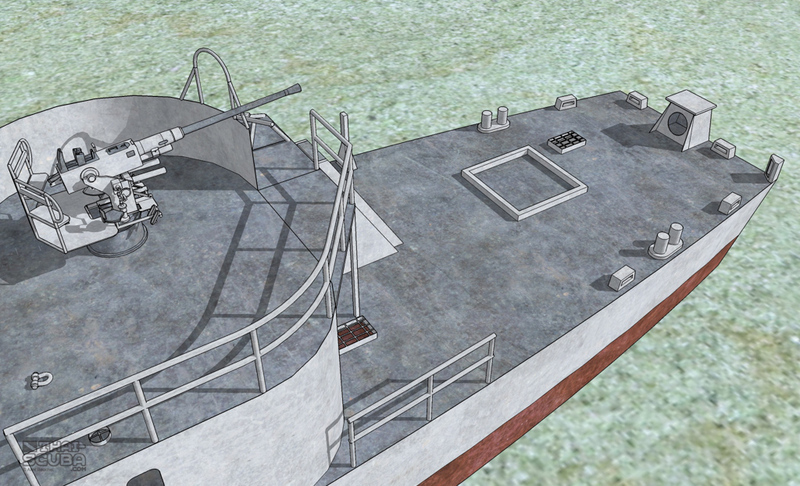 Two 20mm cannon turrets are situated at the forward corners of the upper deck. 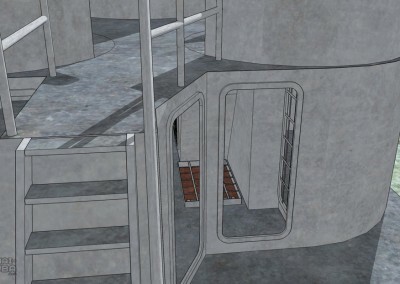 Three door ways give easy access to the inside of the upper cabins. 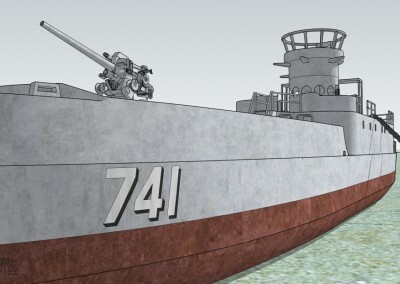 The Thai Navy ship registration number “741”. 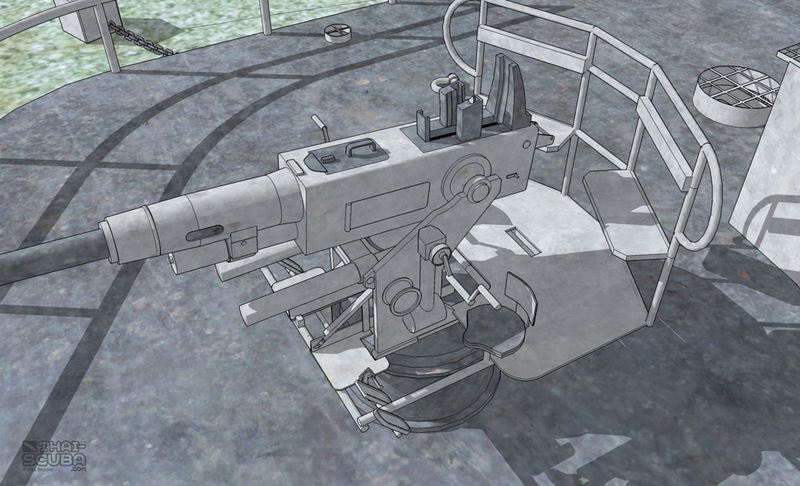 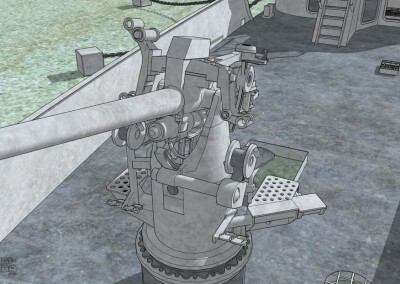 On each side of the 3″/50 caliber gun you will find a seat, foot plates and a crank, one for turning the gun sideways, the other for up and down tilts. 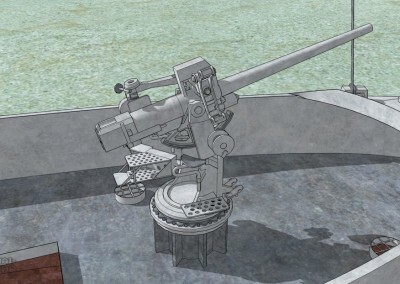 The Bofors 40mm gun at the rear of the upper deck. 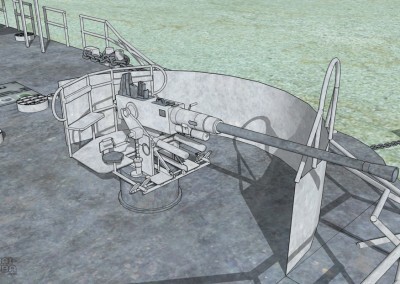 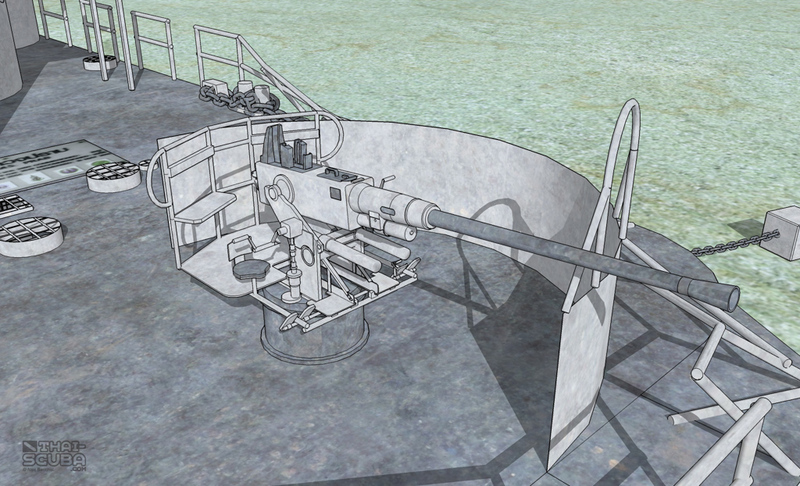 The 3”/50 caliber gun as seen from the main deck. 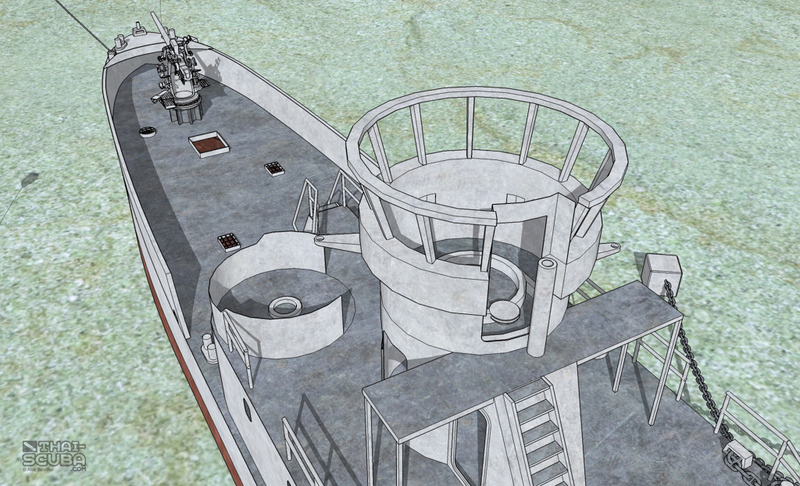 The bridge at the tower is also easily accessible. 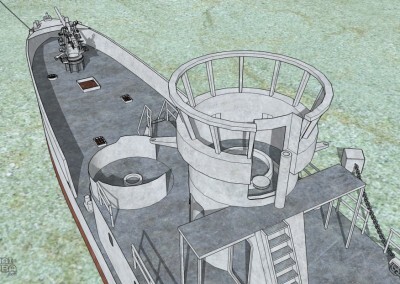 The stairways leading down, however, are caged off. 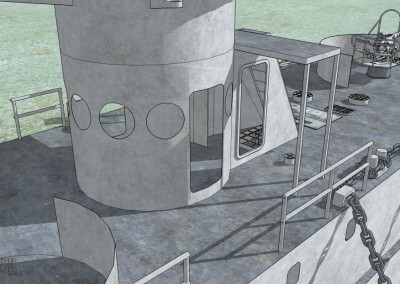 The roof of the conning station has collapsed since the sinking of the wreck. 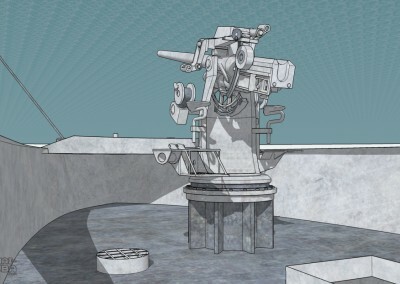 A commemorative plate is bolted to the main deck behind the tower. 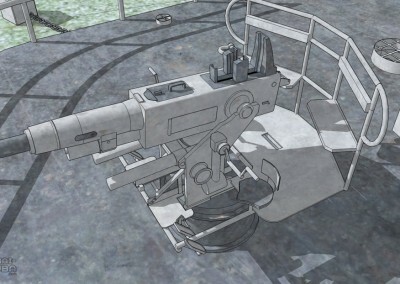 Likewise, here are two seats with foot plates, one on each side of the gun, for rotating and tilting the gun. 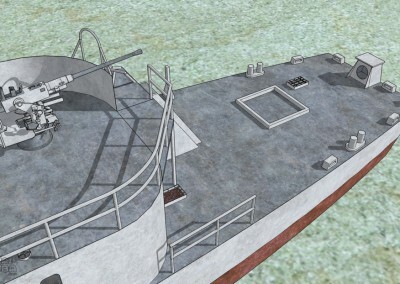 The seats in the back were used by the sailors in charge of aiming on the target. 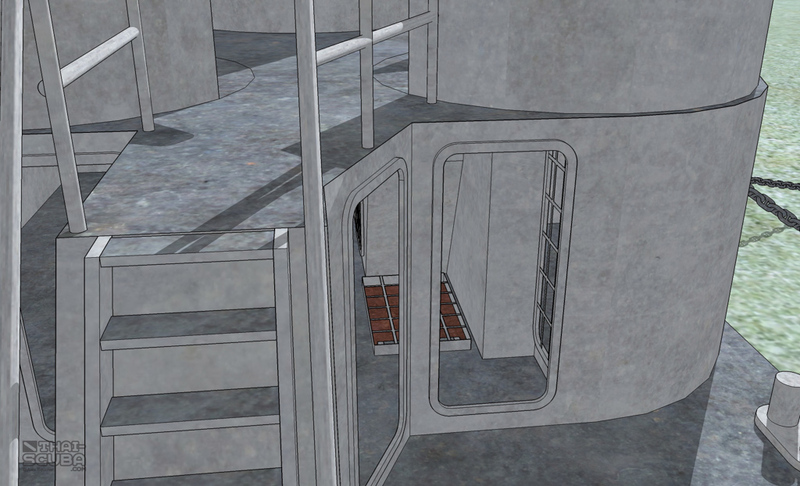 The doorway under the stairs is the rear access point to the inside of the upper cabins. 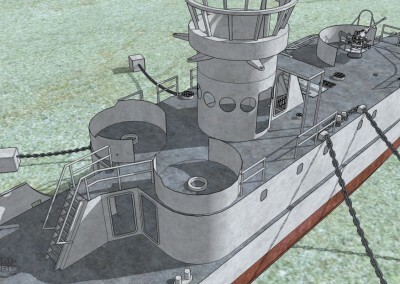 Main deck at the stern. 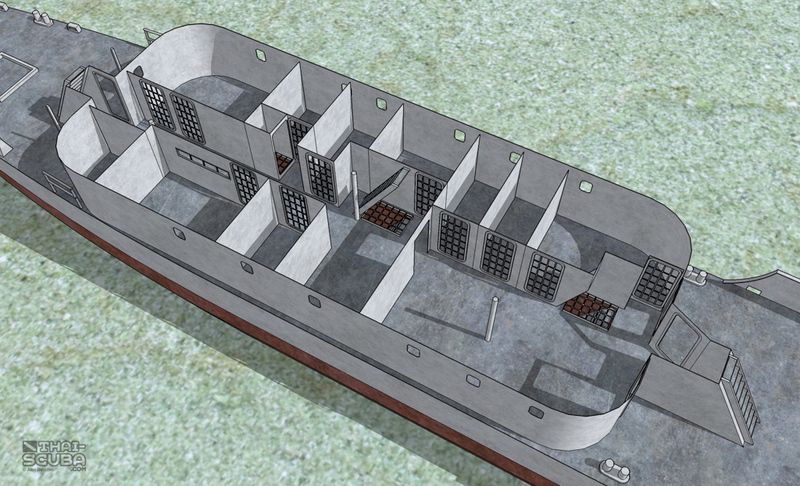 Here a diagram of the upper deck cabins. 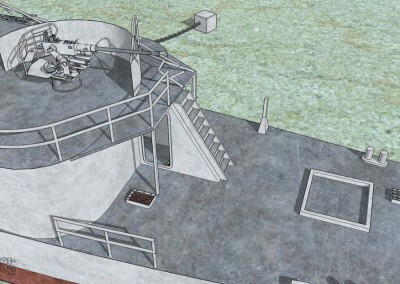 Three door ways allow access at the forward side, one door way at the rear. 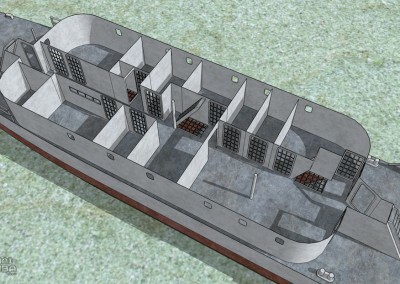 A straight hall way leads from one end to the other with caged-off cabins on either side. 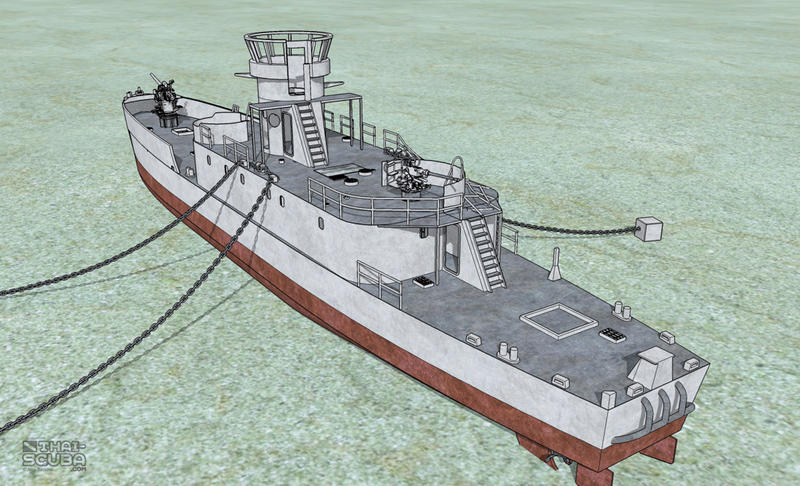 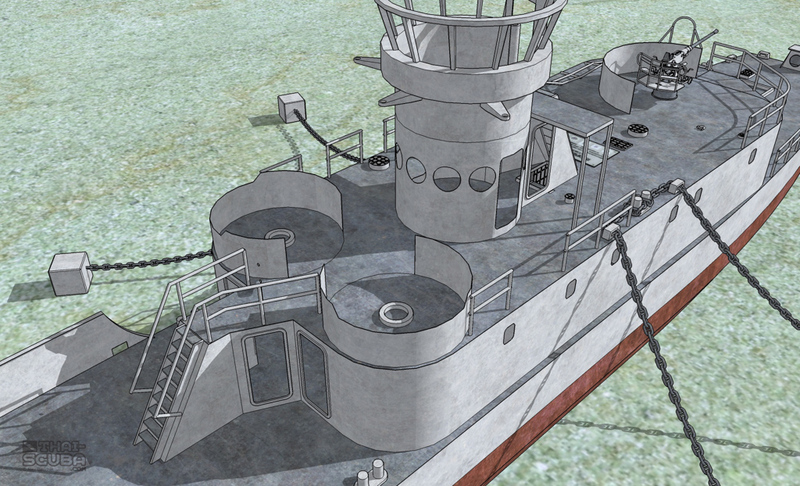 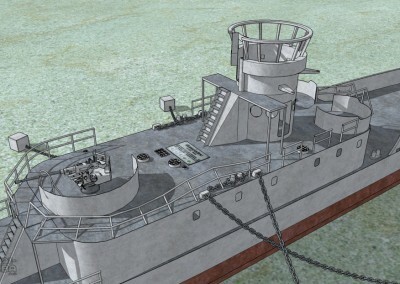 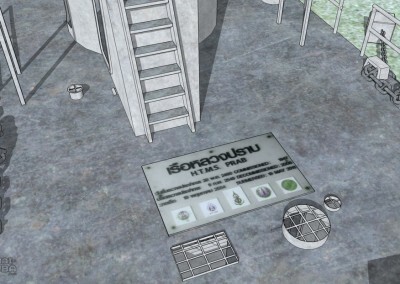 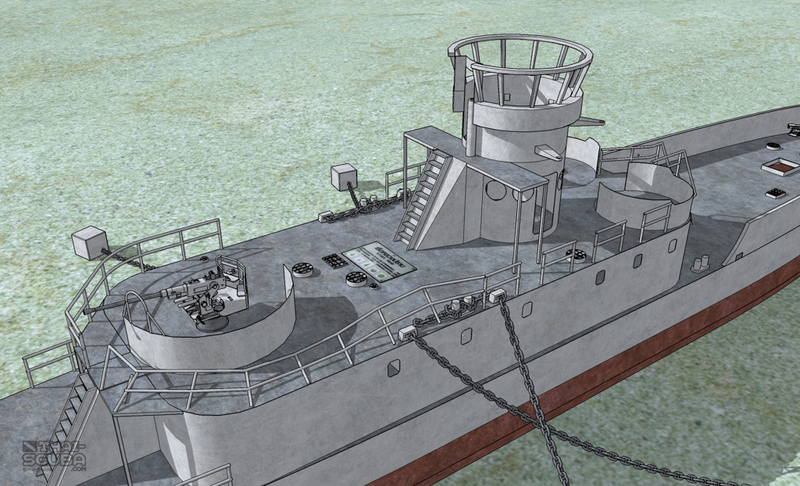 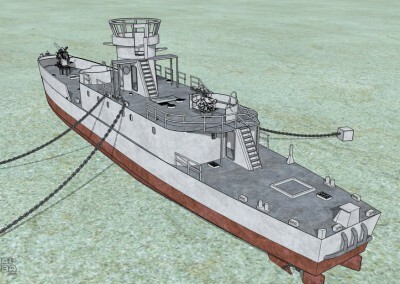 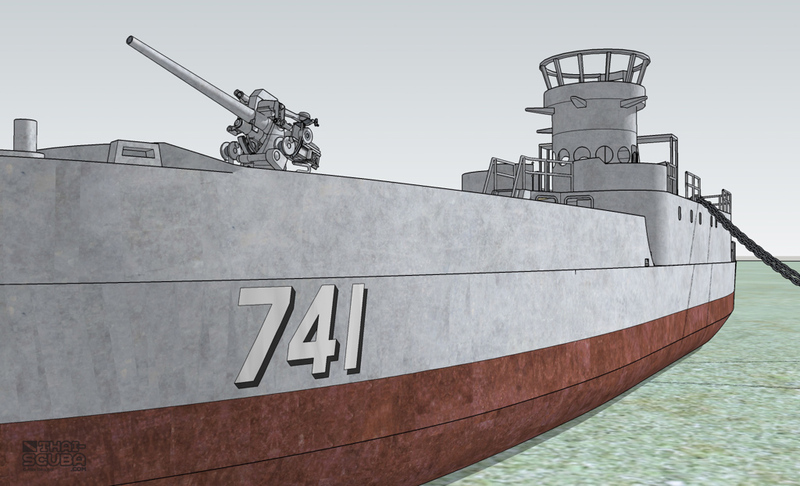 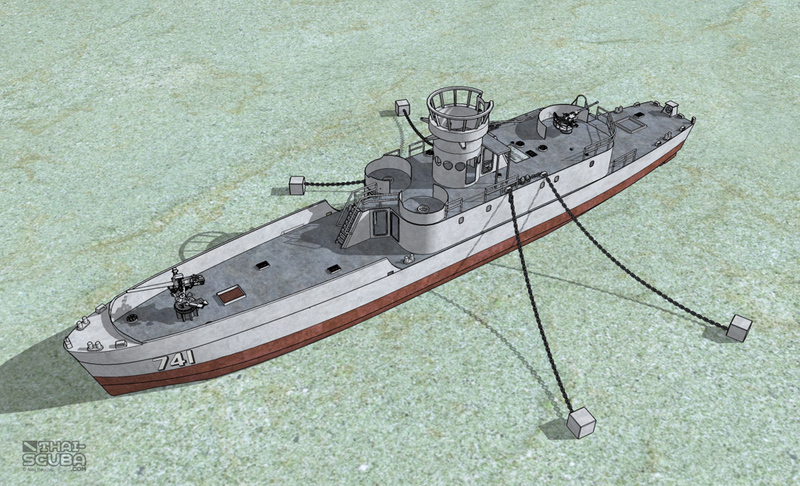 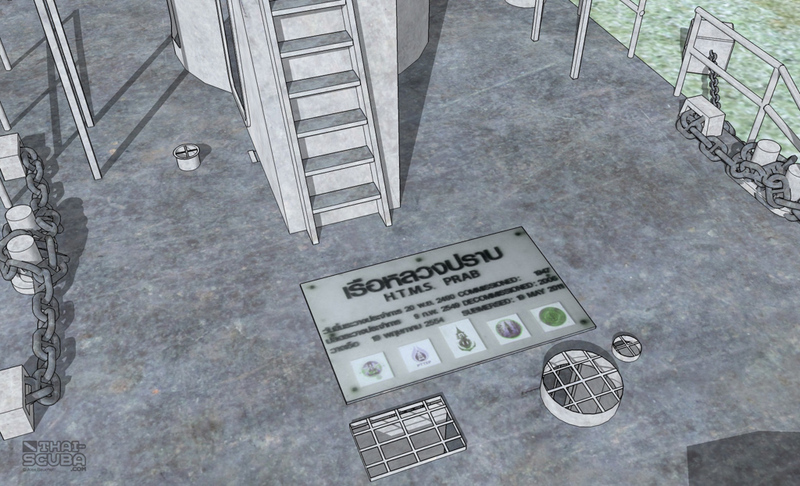 Here two 3D animations of the HTMS Prab Wreck model produced by Thai-Scuba.com. 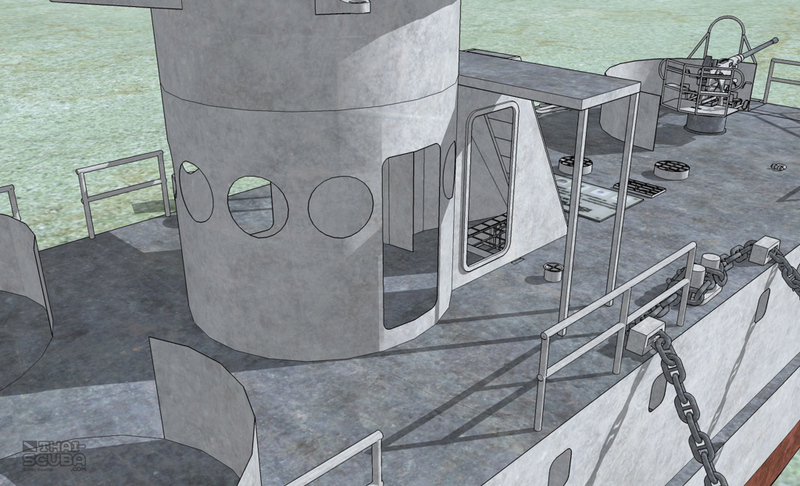 The first a full tour of the wreck in 3D, the second a journey through the interior penetration spaces in animation intercut with dive video footage.